It’s not surprising when liberals violently protest someone like Milo Yiannopoulos, who thrives on offending people and being outrageous. But liberals at Middlebury College just shut down a talk given by two people unlikely to cause liberals to become unhinged: a political scientist and a college professor. Dr. Charles Murray is a libertarian political scientist, as well as a W.H. Brady scholar at the American Enterprise Institute. He was joined by Allison Stanger, a professor of international politics and economics at the college. 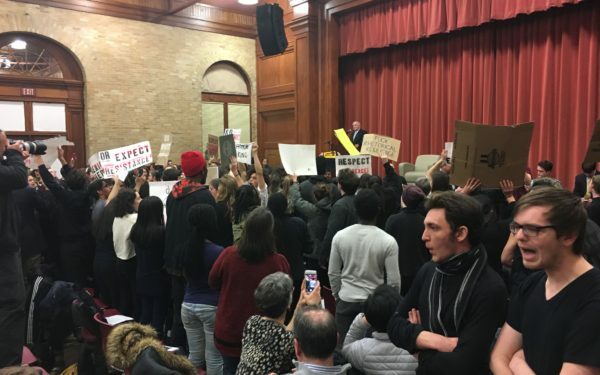 Rather than listening to the lecture and engaging with Murray and Stanger, protesters flooded the lecture hall carrying profanity-laden signs and screaming at the top of their lungs. The signs had things like “RESIST WHITE SUPREMACY,” “RESPECT EXISTENCE OR EXPECT RESISTANCE” and “F*** WHITE SUPREMACISTS” written on them. The reason for the liberals to get offended? Murray’s study “The Bell Curve,” in which one chapter discusses race and intelligence. Campus authorities were eventually forced to shut the event down after 20 minutes of protesting went on without stopping. Instead, organizers livestreamed the event. After the lecture, things got even more violent. When Murray and Stanger attempted to leave, the protesters chased them, surrounded their car, jumped on it and tried to prevent them from leaving campus. The college, meanwhile, did not go the route other administrations have. Rather than defending the liberal protesters, they slammed them for their actions. Murray also wrote a long letter, published in the Middlebury Campus, defending himself and his study, as well as debunking the mischaracterizations of his work. But then, when have facts ever mattered to liberals?